Been pretty busy, lotsa fun stuff going on! Got 3 weeks of solid MT (Muscle Tension) hill repeats in, felt *really* productive.. Operation Build Stronger Legs seems to be succeeding! Cardio has been dropping (as expected) but i can tell that there's a little more ummph in the legs. Me likey. Will continue this thru December, and then up the cadence a bit (70-75rpm) following the CTS Tempo riding for another few months to increase my mitochondrias...i'm all about them mitochondrias now! Then back to building intensity around Feb - yippee! This last week my buddy Fredrik from Sweden, and cycling buddy on VeganFitness.net was visiting (he had a work conference in Portland, so i said 'why not visit Victoria while you're moderately close!) so we had a fun cycling adventure week! 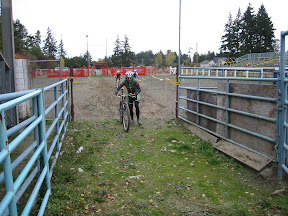 Sunday went out to the Cowboy 'Cross race, which was my first cyclocross race, and it was AWESOME. If there are 'cross races happening in your area, go race, or at the very least, go and watch. They're a total hoot!! I don't have any references, so i can't say how this course differed from others.. It was at the Luxton Fairgrounds, which is unfortunately where a yearly rodeo occurs. Cross bikes are pretty much a road bike with narrow knobby tires, but i only had my ancient mountain bike. Basically, it winds inwards, then reverses and spits you out, very tricky! That lands you at the first obstacle, a large log.. I would get off and jump over it, up a little grassy section and then get dropped into the 'mud' section, which again had a short up, then a steep descent, which placed you in front of a steep ascent, which also had to be climbed...at the top of this it didn't make sense to get back on the bike, it was behind the stands, so you ran around the corner, than THEN got back on the bike..this killed me the last couple laps! After riding along behind the stands, you hit a sharp gravelly corner, and then stairs to run up, and then back along the middle of the stands..again, sharp gravelly corner, then back along the very front of the stands, and the final zig-zag from a sharp, gravelly corner (these killed me too) and another straight-away, which was the only place i ever made up any ground or time...once i got up to speed, i was fine, but the start-stops chewed my legs out. I'm a 'fast or faster' kinda rider, not stop and go! Fredrik takes a pic here the *one* time i had to dismount! Thanks for these pics, Fredrik!! I had this one down pretty good! 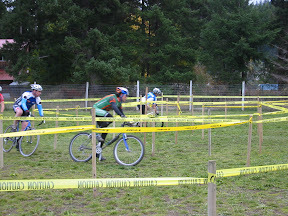 After this was another big, wide corner behind the buildings, and you ended up back at the start line. We did 9 or 10 laps, making about 40mins of crazy racing! I was in the 'Intermediate' category (figured i was a bit strong for 'Beginner', and still have a way to go before joining the 'Expert' racers!) and finished 8th out of 11, three minutes behind the winner, but only a minute separated 3rd thru my 8th.. Watching the rest of the racers was pretty awesome, since i knew what the course was like...they were pretty skilled and very smooth on and off the bike, or just riding over the elements.. 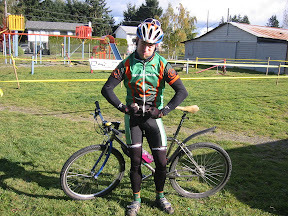 Unfortunately, the next (and final) two cross races are next weekend, and i'll be in Burnaby racing on the track there! Ahh well, i'll be ready for 2007!! Fredrik and i rode the Galloping Goose out, and rode it back into town, with a brief stop to show him the track Clubhouse and velodrome. It was actually dry enough to ride, but we were both pretty beat, it was a cold day, and neither of us had brought enough food or clothes to stay warm standing around (we were there 10am-3pm!) D'oh! Monday had us head offroad..well, for half an hour.. We left just after 3pm, but thanks to Daylight Savings, it got dark an hour earlier than i'd planned, so we only had 1/2 an hour to bounce off the rocks and roots, but it was still pretty fun. Tuesday we took it easy, and then he was gone!! Thanks for the fun visit, Fredrik!! 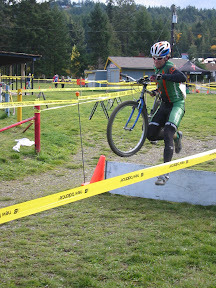 More pics of our adventures and the cross race here in my gallery. Results and more pics from the race here on the race site. Here it is! Thanks to OBB for allowing me work in the shop! All built at home, yay! It rides quite differently from my road bike, as to be expected with a higher bottom bracket, and it's much more stretched out with a far wider wheelbase.. The all-aluminium also makes for a much more jittery ride.. The pain job matches my OrganicAthlete colors tho! Went out for another hour today, much nicer weather! In the afternoon Kevin, Michelle and their new little girl Keelin went out to the track to pick up my bike, and Kevin and i went for a short run along the trails there (maybe 20-30min?) It's my conclusion that running with someone else doesn't really mean i'm going to enjoy running much more...hehehe..
Have a fun week, sports fans!! Are you going to get cross tires as well? when are you posting your ' i got worked' log?